Alfresco provides a modern software for document-management, based on open standards. The IT IS module integrates Alfresco in Odoo for managing your business-critical documents, appointments and tasks smart and easily. 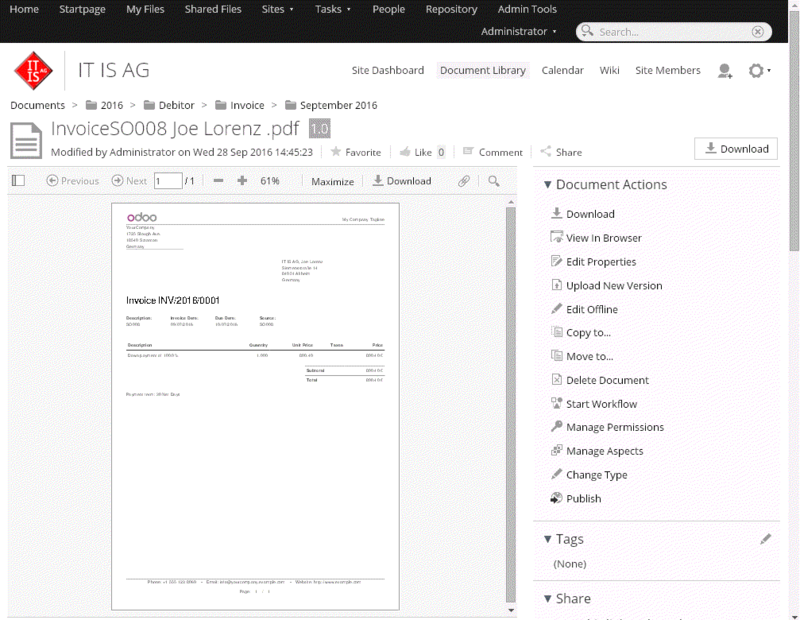 Simplify the handling and structure your Tools and document management directly from Odoo. Available for Odoo 8 and 9. By clicking on the document link in Odoo you are redirected to the latest version of that document in Alfresco. The entered values from the upload-wizard, are shown on in the document properties in Alfresco. In Alfresco you can see the version history, of course. With our module you can also manage your calendar and tasks and sync with Odoo and your calendar in Alfresco. 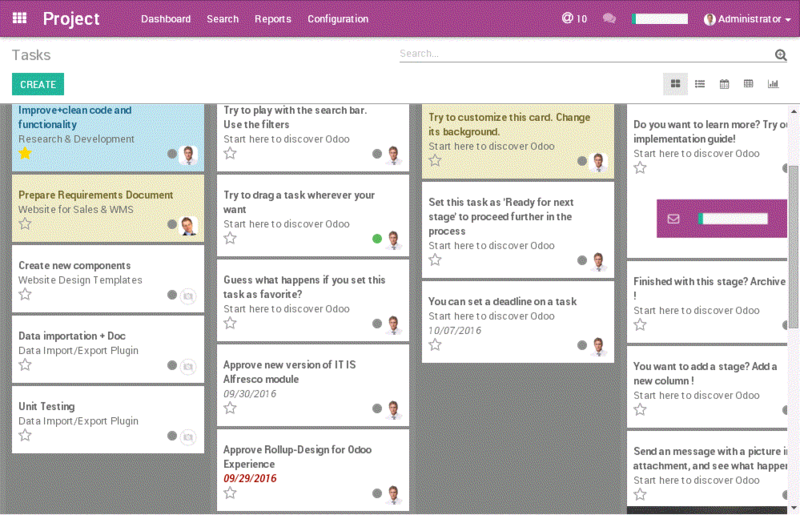 Tasks from Odoo will be transferred to Alfresco and vice versa. In the new version you can also use workflow-tasks from Alfresco. 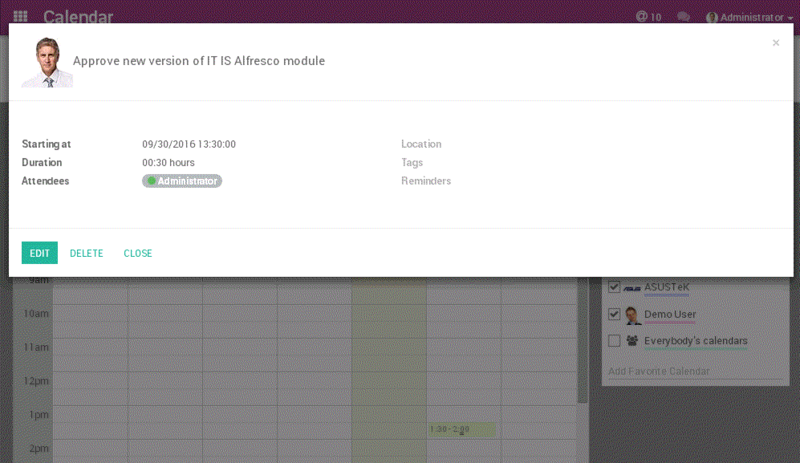 With the new version of IT IS odoo Alfresco, you can create calendar entries and/or project-tasks in Odoo, based on workflow-tasks from Alfresco. The synchronization can be done manually or automated. You can setup your connection for Alfresco and Odoo easily by using the setup wizard. Our module allows a number of settings and configuration for sites, folders and reports according your requirements. The configuration is also based on the report model. With the auto-archive functionality, documents are placed in a special archive automatically. This can be configured by time and document-type.